This coffee cake is incredible. If you like citrus, you'll love this recipe. In a large bowl, dissolve yeast in warm water. Let stand until foamy, 5 to 10 minutes. Stir in warm milk, orange juice, sugar, ricotta, orange zest, salt and egg into yeast mixture. Using a heavy-duty electric mixer fitted with the paddle attachment and set on low speed, beat 2 cups flour into yeast mixture until a wet dough forms. Beat in the remaining flour, 1/2 cup at a time, until stiff dough forms. Turn dough out onto lightly floured surface and knead until smooth and elastic, 5 to 10 minutes, adding more flour as needed to prevent sticking. Place the dough in a large, greased bowl, turning to coat. Cover loosely with a damp cloth and let rise in a warm place until doubled, about 1 1/2 hours. Grease a 10-inch springform pan. Punch down the dough. Turn out onto lightly floured surface and knead for 1 to 2 minutes. Divide the dough into 3 equal pieces. Roll each into a 20-inch-long rope. Braid the ropes together. Coil braided dough in prepared pan; tuck ends under. Cover loosely with a damp cloth and let rise in a warm place until almost doubled, about 30 minutes. Preheat oven to 425 degrees. Brush the dough with glaze. 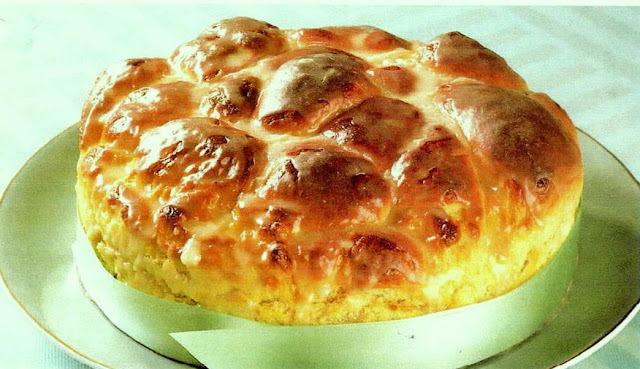 Bake until the top of the cake is golden brown., 25 to 30 minutes. Turn the cake out onto a wire rack to cool slightly. To prepare icing, in a small bowl, stir together confectioners' sugar and orange juice until smooth. Spread icing over warm cake.